I do all my movie-watching on airplanes. I am watching one now which inspired me to pull out my phone (in Airplane Mode, of course) and start reviewing immediately while I watch. If you infer that I am less than captivated, you are correct. I make no apologies for my incoherent writing in the last paragragh, which perfectly describes the situation. I do apologize (fingers crossed behind my back) for my lack of intellectual and spiritual capacity to appreciate what might be a brilliant piece of art. If I weren’t so enamored of my blog, I would have switched channels long ago. I am watching and writing at the same time. Maybe I’m not giving a fair chance to the movie. In any case, I had to watch to the end so I could report to you. A 15-hour flight is a rare opportunity to watch a long strange movie and write a long strange review, so here it is – ready to whiz through the internet once I find wifi. Friday last week, I endured a 14 hour return flight from Dubai, UAE to Toronto. Like yourself I save my movie watching for long, long flights. I also tried to watch this movie, and actually gave up about 2 minutes in. 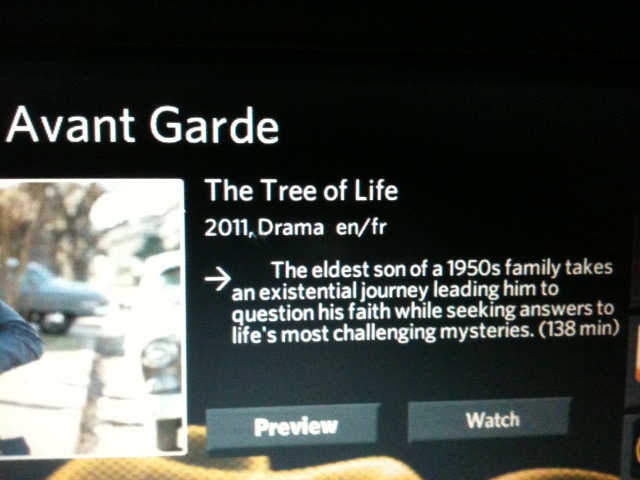 I had read about it being part of Cannes Film Festival, and thought I will have uninterrupted time to view in flight. Kudos to you for hanging in, I gave up and went back to watch Ashton Kutcher/ Natalie Portman chick flick, better use of my time and way more entertaining.